I know, I know. Some of you out there have sworn off Elysian ever since the InBev buyout, but they do still make some fine beers and they have made a few drinking suggestions for National Beer Day for some of the different types of beer drinkers out there. The Beginner – Put. Down. The. Shandy. Instead, here’s a refreshing fruit-forward brew packed with the citrus of juicy blood oranges. Coming in at an easy 6.4% ABV, Superfuzz Blood Orange Pale Ale boasts a whirl of alluring fruity aromas to delight everyone from the novice beer drinker to the certified beer snob. The Up for Anything Beer Drinker – Love experimental ingredients? Down to try just about anything? How about flowers? The botanical beauty that is Avatar Jasmine IPA is a fresh and floral brew flavored with real jasmine flowers. It’s available in 22 oz. bottles, but don’t worry. You don’t have to share. The Hop Head – You know what a real IPA is. Your palate craves the bitter bite of Chinook, Citra, and Amarillo. You’ve been around the bar a time or two and you know your suds. Thats right. You’re an IPA lover. For the true IPA fans, Space Dust IPA is your go-to. The Dark Side Drinker – Maybe ales aren’t your thing. You’re sophisticated tastes call for a darker, richer brew. 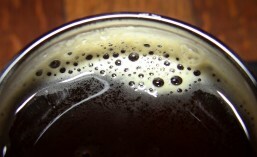 Dragonstooth Stout is a roasty and hearty stout without the heaviness. Ideal for those with an affinity for all things dark (and maybe even a little bit dangerous). Also, please note that Elysian is pleased to announced the 2017 return of Superfuzz. They’ll be celebrating with a launch party at Capitol Lounge on Friday, March 31. Event Description: Join Elysian Brewing for the seasonal release and tasting of its Superfuzz Blood Orange Pale Ale, a mind-bending whirl of the aromas and flavors of blood orange and Northwest hops. Guests are encouraged to dress in psychedelic 70s attire and there will be a live DJ spinning P-Funk jams throughout the night. This Elysian beer will only be available from April through July on draft and bottled. So are you all set to celebrate National Beer Day? Be sure to pick up some Elysian beers either at the brewery or your local retailer before the big day arrives. Are you a beginner, up for anything, a hop head or a dark side drinker? Whichever way you go, Elysian has you covered. Still swearing off Elysian? Well there are plenty of other local breweries who can satisfy your craft cravings on National Beer Day. Enjoy. This entry was posted in Ale, Award Winning, Beer, Beer Ingredients, Beer Labels, Beer Release, Best Of, Bottle Shops, Bottling, Branding, Brewing, Capitol Hill, Craft Brewery, Distribution, Draft, Events, Hops, Imperial, IPA, Local, New Release, On Tap, Pale Ale, Promotion, Restaurant, Retail Product, Seasonals, Seattle, Stout, Taproom, Taps, Tasting, Washington, Washington Beer and tagged 2017, April, beer, Beer Release, events, National Beer Day, Pyramid Brewing, seattle. Bookmark the permalink.